I fly a lot and it seems that lately the drama seems to follow me onto the airplanes. Recently the FBI met a flight I was on; you can read about that here. As she turned to leave I leaned over to Donnie and said, “In Spanish too.” I didn’t think she heard me. I was just being my typical self making wise cracks. A few minutes later the flight attendant returned and pointed to me and said, “Do you really speak Spanish?” I replied that I did and she said, “Come with me.” You don’t have to fly a lot to know that you are supposed to follow the instructions of the flight crew. So I got up and followed her up to the front of the plane. She pointed to an elderly Hispanic woman and asked if I could help her understand what she was saying. I introduced myself to the woman and offered to help. She said that her bag had been taken from her when she got on the plane and she didn’t know where it was but she wanted to find it. She said it was a black bag full of books and that since it was heavy she needed help with it. We started checking the overhead bins but couldn’t find it so I asked her if it was taken from her before she got on the plane or after. She said it was as she got on the plane. That didn’t help as I was trying to figure out if it had been gate checked or not. I also couldn’t figure out why she was so concerned about these books. By this time, another flight attendance came up and said she had taken her bag and it was in a bin behind further back on the plane. I told her but she wanted to see the bag and make sure the books were still in it. So we go the bag down, opened it up and sure enough it was full of a bunch of books. The lady smiled in relief and said they were books for her church. I told her we would put it back and since it was heavy, someone would help her get it down when we landed. She said thanks and I sat back down. The rest of the flight was uneventful. Thus concludes my first official task helping a flight crew. Stay tuned, subduing an unruly passenger is probably in my future. Yesterday my wife and I spent the morning at the World of Coke in Atlanta. We have been to the World of Coke in Las Vegas several times but this was our first trip to the one here in Atlanta. The Las Vegas edition is basically a very large Coke store with a small tasting experience while the Atlanta edition is a full-blown museum, multi-media experience, store, bottling line (you get to take a bottle with you when you leave), and a full-blown tasting experience. My wife has collected Coke stuff since she was in high school. We have enough memorabilia to open our own Coke diner, complete with soda fountain and the jerk to operate it (that would be me). On our first trip to the Vegas store, we had 5 boxes of stuff shipped home. The experience was a lot of fun. They have a 4D theater, a 3D theater, and a very large entrance theater where the screen raises to reveal the entrance to the World of Coke. That was cool. As you would expect all through the museum I was tweeting and I was impressed how quickly @worldofcocacola responded to my tweets and even retweeted a few things I said. That shows they get the power of social media and are fully tapped into it. I enjoyed the whole new Coke vs. Coke Classic fiasco of 1985 exhibit. Think how different that would have been if Twitter and Facebook had been around in those days. My favorite part by far was the world tasting room. 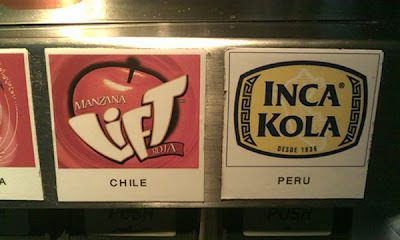 I really like Inca Kola from Peru and Manzana Lift from Chile. Inca Kola is like drinking cotton candy while Lift is the best tasting apple soda in the world. Asia has a few that try but they are either excessively sour for my taste or a bit bitter. Plus they are often a neon green color that makes you feel like you are drinking antifreeze. My least favorites, first tried in Vegas and confirmed again in Atlanta are from England and Italy. Italy has a lemon soda that is not good at all, worse than drinking lemon Pledge. England has a clear soda that might as well be called Carbonated Bitterness, but instead I think the name is Beverly. Poor girl. Last Friday I was able to relive my childhood as the new A-Team movie opened nationwide. As a kid, I loved the A-Team and Knight Rider. If I wasn’t a good boy, my parents wouldn’t let me watch these shows. That was great motivation to behave. For the sake of brevity I won't discuss the latest remake attempts of Knight Rider. I don’t often do movie reviews but here’s a hacked review of the movie. Warning: spoiler alerts galore here. As a TV show, the A-Team and its creators changed the way action shows were filmed. The whole camera-on-the-ground-with-the-car-driving-over-it effect was done first on the A-Team. The original show also provided a lot of action without a lot of gore. Watching the show now in reruns on Centric, it looks like an 80’s cheese show but in the day it was very cool stuff with a wide fan base. The movie isn’t exactly a continuation of the TV show but rather an adaptation of the story in modern times. The movie shows how the team forms, gets court martialed, escapes, and then ends up as soldiers of fortune. It uses the Iraq and Afghanistan wars as the backdrop. From there on the story rings true to the A-Team and the cast fills the roles of the traditional characters with ease. The story is exaggerated with over the top special effects but believable within the A-Team paradigm. I was impressed with the conservative language and general modesty of the movie, especially considering the Face character. I was surprised to learn that they shot the entire moving in Vancouver. The movie covers Mexico, Iraq, Afghanistan, Los Angeles, Germany, and more but they shot the entire thing over 5 months in one location. My A-Team and Star Trek fandom collided together during my Star Trek days as I was able to meet Dirk Benedict (Face) and Dwight Schultz (Murdock). Dirk was in many Sci-Fi TV series and Dwight was in Star Trek: the Next Generation as well as Star Trek: Voyager. Both are also in the new A-Team movie but you have to sit through the credits to catch the cameos. Face with Face and Murdock with Murdock. Very funny. I knew from reading a review that there was a special treat for the TV shows fans if they stayed through the end of the credits. So while watching them I saw Dwight Schultz as German Doctor #1 but I couldn’t remember having actually seen him in the film. It all made sense when I saw the ending so it was like a mini-spoiler having seen his name in the credits before he actually appeared on the screen. All in all this is a great continuation of the story and I hope they make a sequel. If you’re not humming the theme song by now you really should be, that is if you consider yourself a true A-Team fan. And yes, I still have my action figures and A-Team van Matchbox car. I finally did it. I purchased my own name as a domain name. The millions of reading of this blog know that the address of http://jonathanesmith.blogspot.com/ is just too hard to remember. So I shortened it. My new portal on the World Wide Web is now accessible through http://jonathanesmith.com/. Don’t worry, the old address will still work so you don’t have to update your address lists but now it will be much easier for you to share access to this blog with your friends, families, and enemies. As you know, you can find not only these blog posts but also access to my Twitter feed, access to my TwitPics, archived blog posts, and the ability to search the posts and engage in a lively discussion about them. Literally hours of online fun.